Article Summary: A fixed action pattern (FAP) is an instinctive behavioral response triggered by a very specific stimulus. Once triggered, the FAP behavior can’t be stopped ‘midstream’, but must play out to completion. Yawning is one example. FAPs are produced by a neural network known as the innate releasing mechanism. The FAP is triggered in response to an external sensory stimulus known in animal behavior terms as a sign stimulus, or, if it is a signal from one individual to another, it is called a releaser. Kelp Gull chicks peck at red spot on mother's beak to stimulate regurgitating reflex. Niko Tinbergen, a pioneering researcher of animal behavior, studied the egg rolling behavior of the Greylag Goose as an example of an FAP. If one of the gooses' egg rolls away from the nest, the goose automatically rolls the egg back to the nest with a repeated, specific action. When the female notices an egg outside the nest (sign stimulus), she begins this repeated movement to drag the egg with her beak and neck. Sometimes both birds perform the dance together, but in many cases, it is an ornately feathered male dancing for the female. 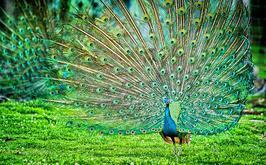 In this case, the key stimulus for this FAP is the presence of the female, and she chooses her mate based on how elaborate his plumage and how well he can boogie down. If, while the goose is rolling the egg back to the nest, the egg slides off to the side, or is removed by an observer, the goose continues to repeat the stereotypic movements, until she reaches the nest. She'll then relocate the missing egg and begin the process all over again. Mating dances are another FAP example. Many varieties of birds engage in this type of courtship behavior, which often consists of a specific sequence of elaborate movements.